Mesquite Garage door service is pleased and honored to be serving the community of Mesquite. We started our garage door business in St George but have grown and expanded for jsut serving St George to having a location and being able to serve the businesses and residents of Mesquite. We have really enjoyed our time working in Mesquite and really hope to expand and keep growing our business and growing relationships with the community here. We are a diverse garage door company and have many different garage door services to offer in Mesquite Nevada. From Garage door installation on new homes to commercial garage door installation. Garage door repair services including the repair of garage door openers. 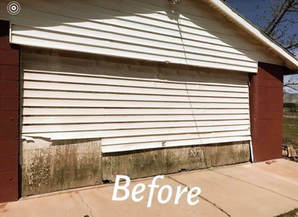 Along with painting your garage door to give it a new look, if there is a garage door service we did not mention and you are curious if we can provide that service for you please give ua a call and we will be able to give you a free garage door instant quote over the phone. It is important to us as a company to provide the best garage door service in everything that we do. From our impeccable work to our exceptional customer satisfaction. Mesquite Garage Door Service knows how important it is to ensure that we are always being professional. Our top two priorities and one does not come before the other, is being professional in our work and being professional with our customers. We always want to come across to customers as a professional garage door company. We as individuals of he staff at Mesquite Garage door Service and our company as a whole have years of professional experience in garage door service. We feel we are not only professionals at what we do but that we have mastered the service. With our willingness and eagerness to always learn and master any new design or technique that is new to the market we know we are second to none and you have made a great choice trusting us with your garage door project. Second but just as important is the professional and positive relationship we have with all of our clients. Taking care of you in a professional and friendly manner is just as important to us as getting the job done. If you our customer is not satisfied with us a a professional company it will not matter how great of a job we do. Being professional in our attitude is just as important and we love to keep that relationship with you and have you call us back the next time you need and garage door service in Mesquite. Providing a great service to our customers and ensuring they were nothing but one hundred percent satisfied with the garage door service we provided in Mesquite is very important to us. Especially in a small community it is so important that we are leaving our clients happy with the work we provided and happy with how they were treated. Customer satisfaction is what keeps us alive as a small business. We know you will tell you friends how great of a job we did on your garage door or how happy you are with your new garage door opener that they will remember to call us when they need a garage door installed in Mesquite or need their garage door painted in Mesquite. We are so grateful for all of the people who chose us and trusted us with their garage door projects and welcomed us into Mesquite as a small Garage door company. With Mesquite still being a smaller city with a lot of growth happening it may still be hard to find "garage door repair near me" or "Garage door opener installation near me" With the population growing and the business catching up it can sometimes mean that you are on a waiting list. With our garage door service in Mesquite we will never put you on a waiting list. We know how important it is to get your garage door installed fast or even more so if you have had a garage door break we will be there to repair your door fast and get it working in most cases the same day. 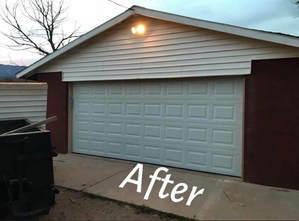 So if you need a Job done fast on your garage and you are searching for "garage door service near me" look no further! Your Mesquite Garage door professionals are only a call away. Now days it almost seems ridiculous to have a garage door without a garage door opener. This amazing convenience to be able to open a heavy utility door at the push of a button has almost become normal and expected. Although you do have to admit it is nice to have a garage door opener installed and working and it is quite an inconvenience when your garage door opener breaks. When you have a garage door opener that is not working there is usually a small fix that will get it up ans running in no time. It is always a good idea to have us come out and take a look at your garage door and your garage door opener so we can see if it can be fixed or if you do need to get your garage door opener replaced. In the years of service we have seen that a majority of the time we are able to fix and repair the garage door opener for a fraction of the cost of a new on. Saving you money and time is always a win in our book. For fast honest and reliable service call us today! Commercial garage doors can range from a large work shop door in your yard to a small business garage door or even a larger industrial garage door in larger commercial buildings. Even though Mesquite Garage Door Service is a smaller company we can handle the large jobs with the best of them. We know how important it is to keep your business running smoothly. if you have a garage door that is not working on your business please do not hesitate to call we will be there as soon as we can to get the issue resolved with your garage door. Time is money and we will do what we we can to help you get things back ruining smoothly. Our Commercial Garage door service in Mesquite include but are not limited to..